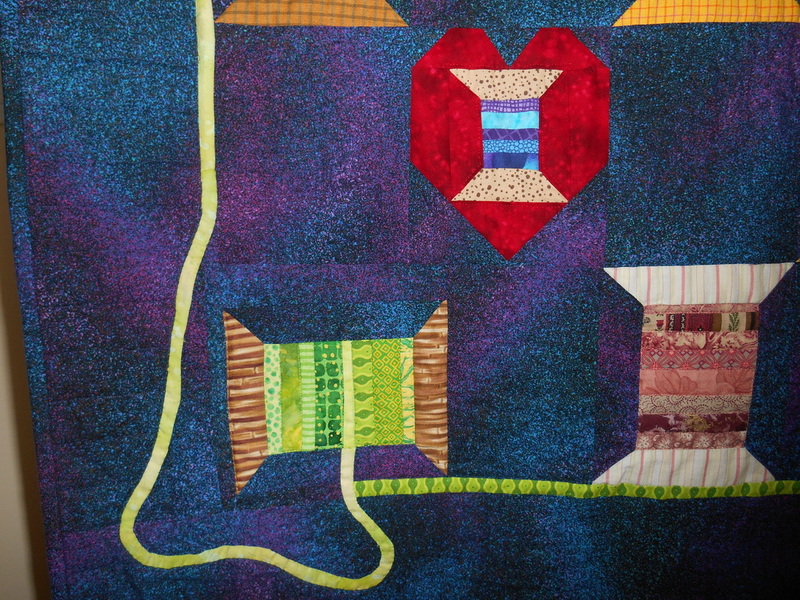 As a member of the McLean chapter of Quilter’s Unlimited of Northern Virginia, we are challenged each year to make a special piece. 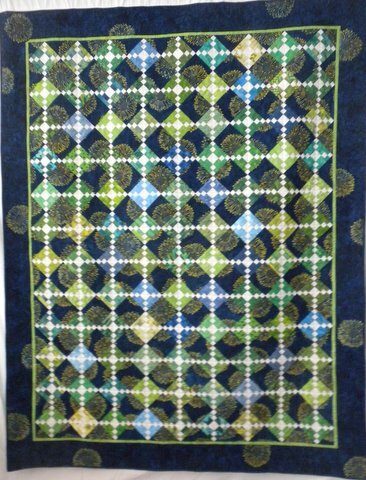 Last year we were given a block from an antique quilt and asked to use it in any way we wanted on a quilted piece. 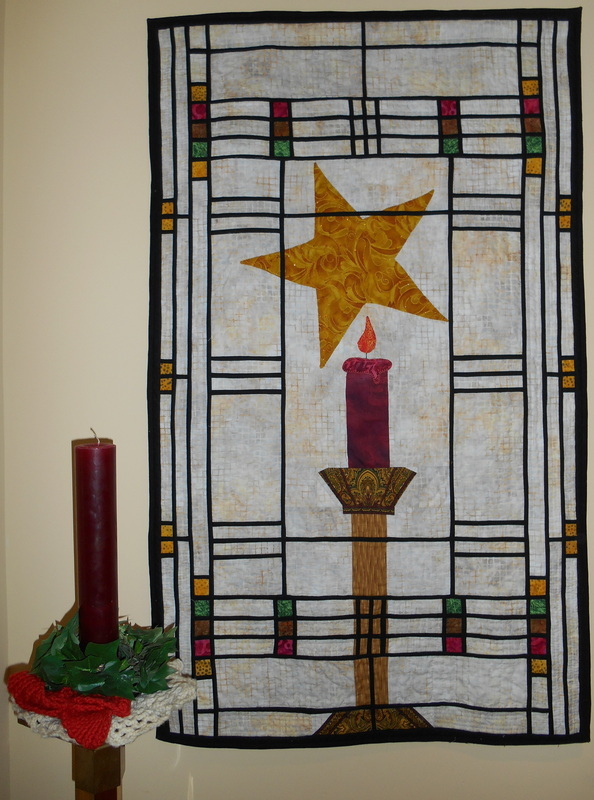 The theme for mine was inspired by a wall hanging made by a friend, Lenore Parham, many years ago. I did nothing to my block other than attaching it to the front of the tombstone. The block design is original. Made just for fun with fabrics I love in 2010. Everyone of a certain age who was raised in the US remembers the Burma Shave signs that were along our highways. 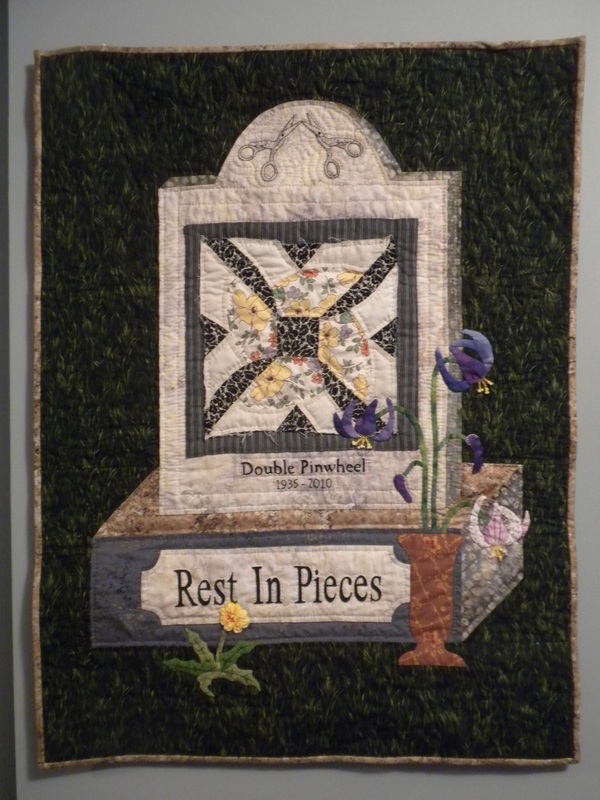 Having wanted to make a quilt on this subject for years, everything fell together in the spring of 2010. 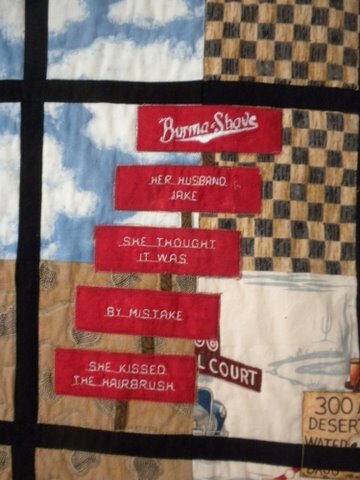 I had a machine that could do all the lettering except the word Burma Shave (done by Starla Phelps) and found fabrics that would work. 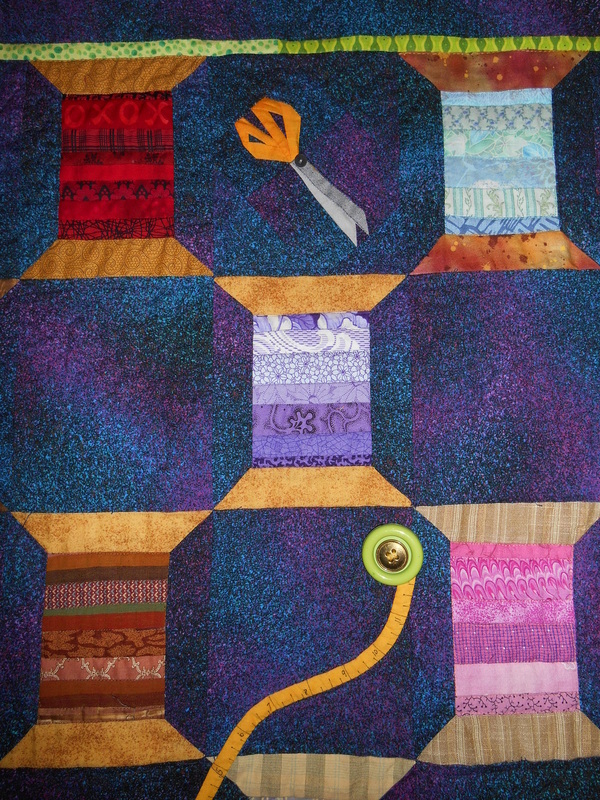 Machine quilting it was good practice for me. 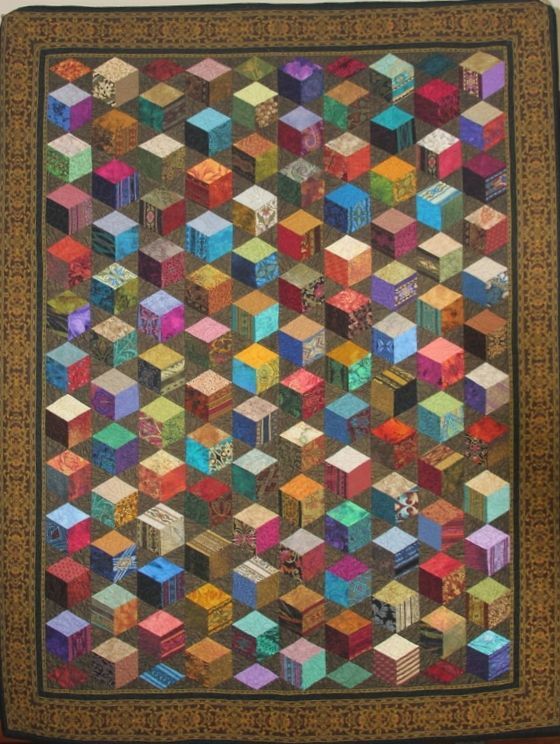 My friend, Suzie Buck, often finds patterns to make for the simple reason that they look like fun. This certainly was. 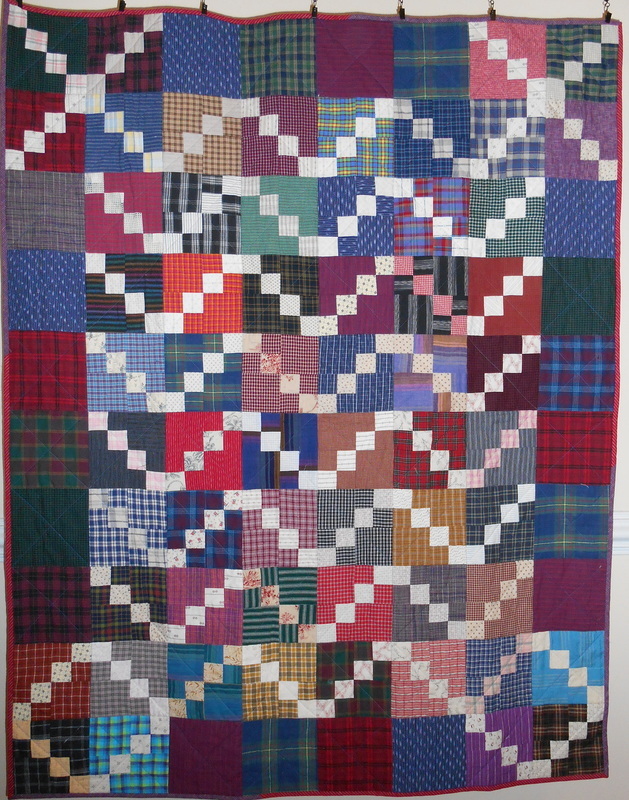 It was also a good use for the alternating square fabric that I had in my stash and an excellent way to kill time during the snowstorm of February, 2010. 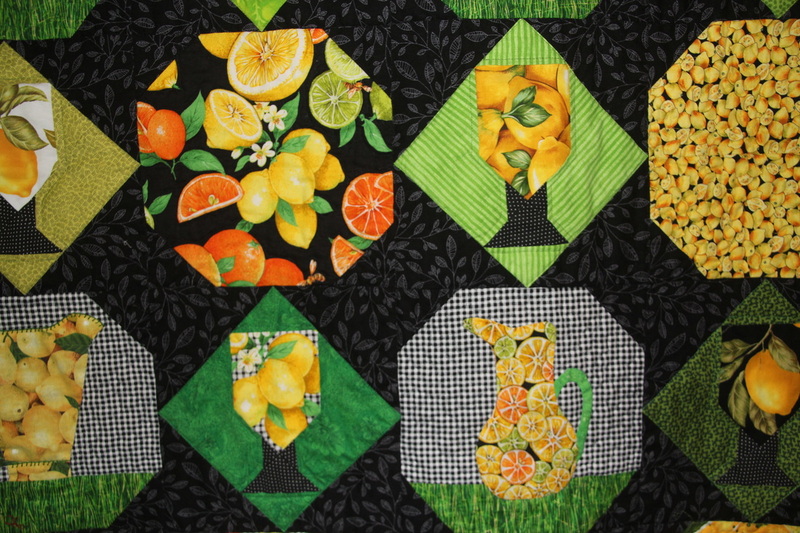 Several of the lime green fabrics were from Judy House. Another snowstorm project, this from January, 2010. When I came to the border a good Asian friend, Yoko Swanobori, came to my rescue and said I needed a good Asian eye. She certainly provided that! 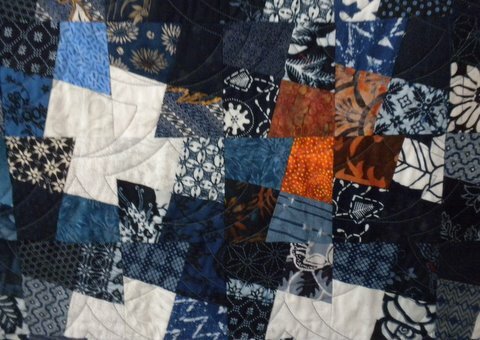 Leslie Pfeifer let me raid her stash for the small rust pieces and several of the navy fabrics were from Judy House. This was inspired by a childhood game I played with my sisters in the 1940s. Motifs were from a Timeless Treasures fabric. 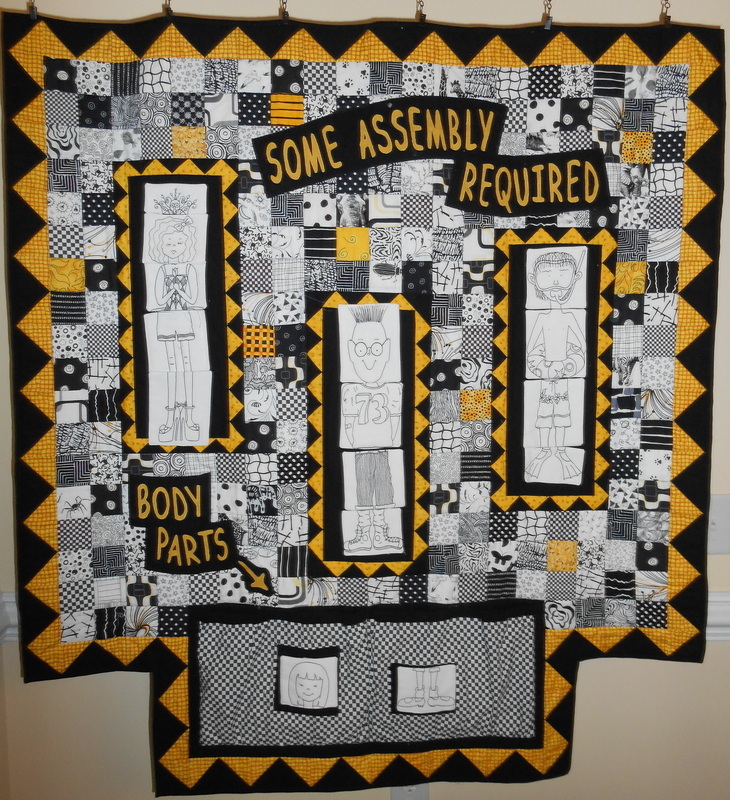 There are many interchangeable parts that are stored in the lower pockets. 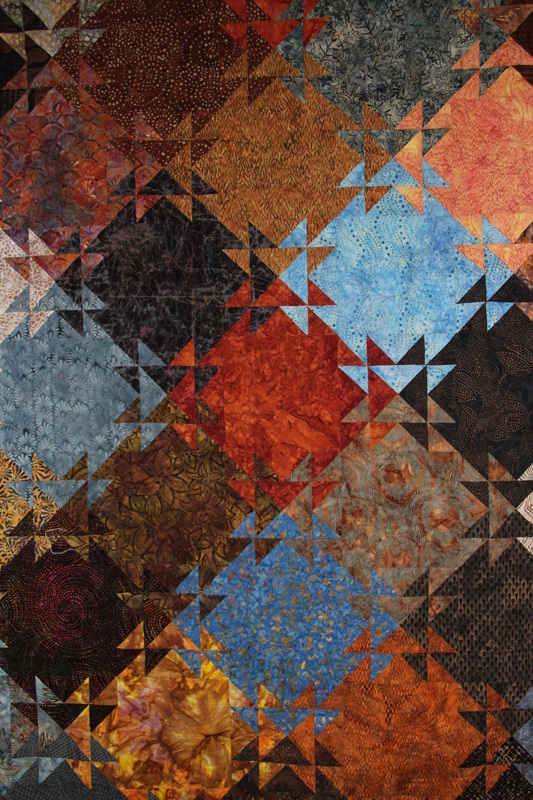 A Disappearing Four Patch technique made in 2011. Machine embroidered motifs purchased at a McLean QU Auction. 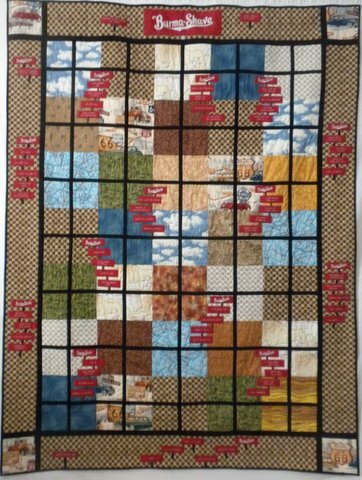 The inspiration for this challenge piece came from an article about writing children's books on page 47 of the 2011 Farmer's Almanac. When I realized the insects on my fabric were flies, I dressed one up as a bee. 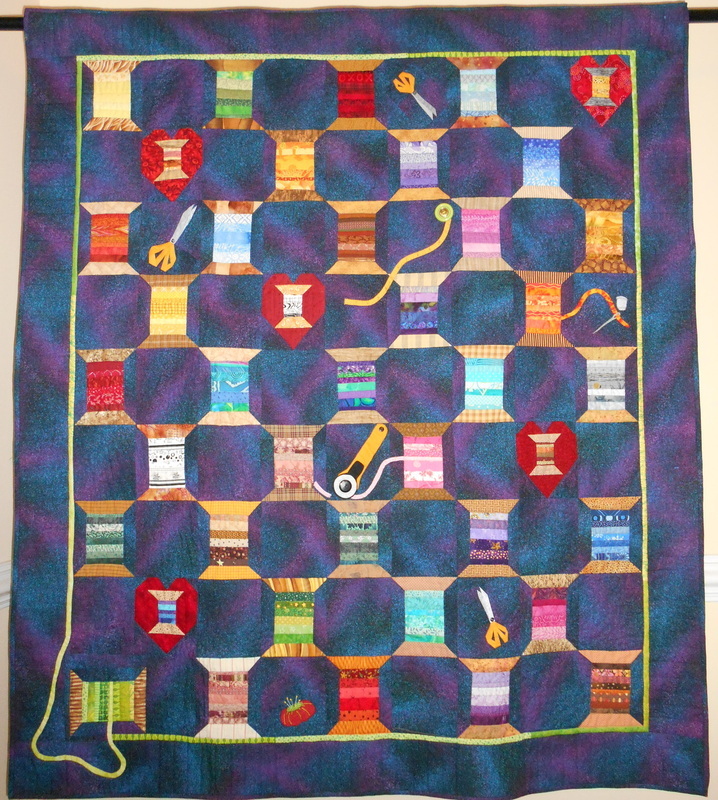 Original design and set with the exception of the thread portion of many of the large spools which came from an exchange in McLean QU in 2012. 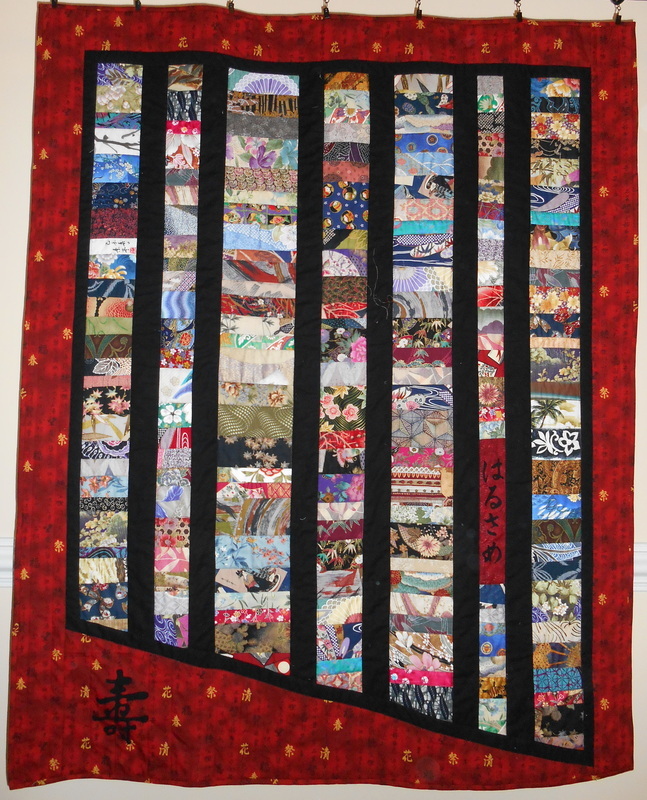 A version of the Chinese Coins pattern, made in 2012 This is the result of many years of collecting small pieces of Asian fabrics. The vertical lettering was drawn by my friend, Yoko. It means Gentle, New Growth or Hope to her. The large symbol is a longevity design. 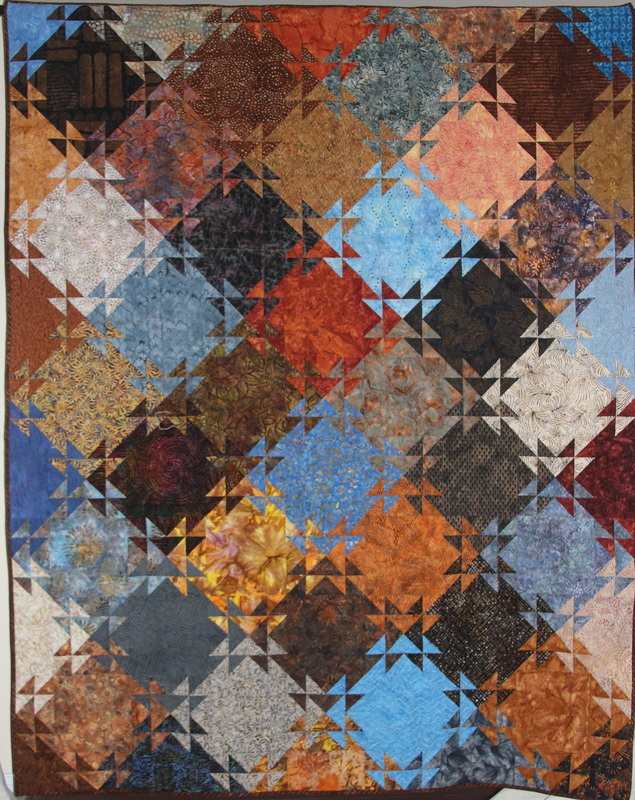 Made in 2012 entirely from stash fabrics. The candle is an original design placed behind a Frank Lloyd Wright window design located in the Arthur Heurtley House in Oak Park, Illinois and found in a commercial pattern book. Made in 2013 from a design by Nancy Feve. 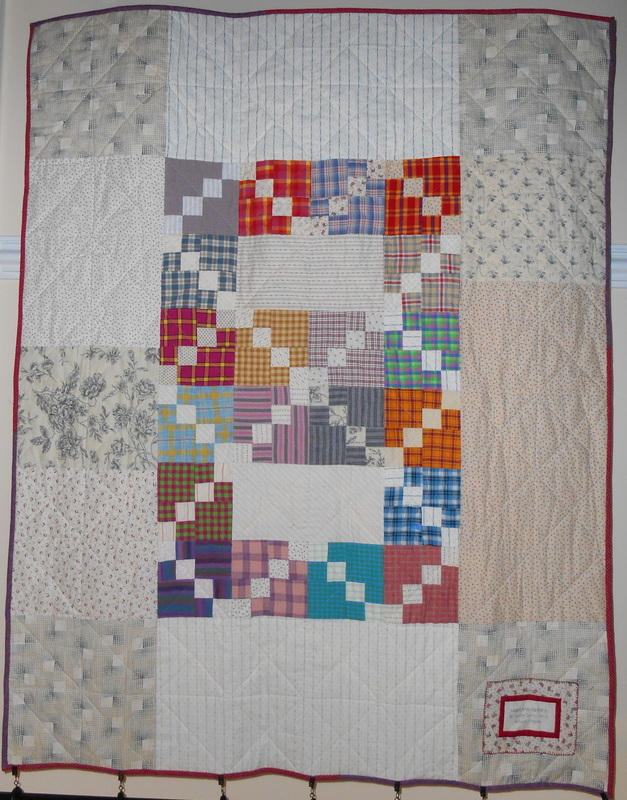 Made in 2013 with scraps of predominantly Jinny Beyer fabrics, some of which came from friends, Nancy and Barbara. 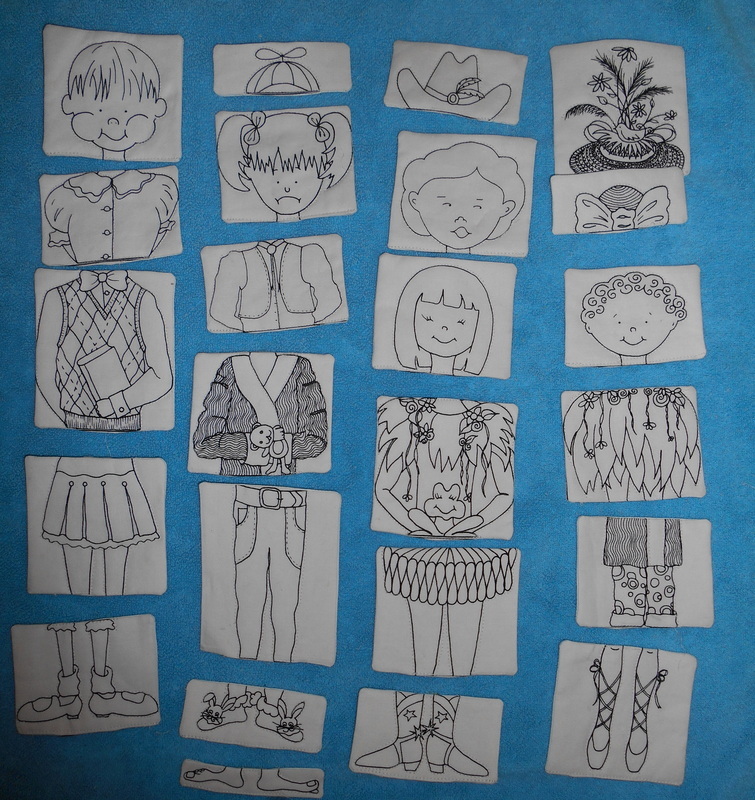 The nine patch blocks were the result of an exchange with friends. The set is referred to as a streak of lightning. It now lives with Emily. 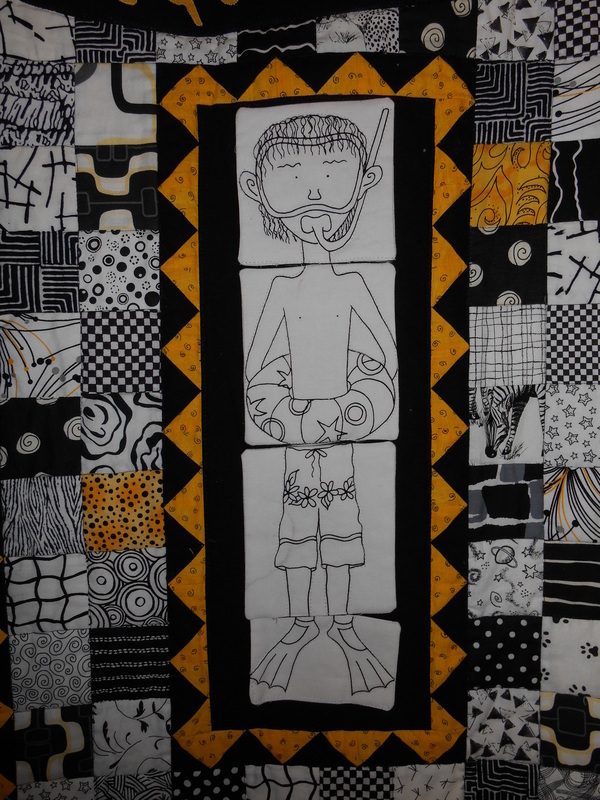 This was a fun way to use batiks that I really liked. It now lives on the sofa in Karey and Ian’s home. 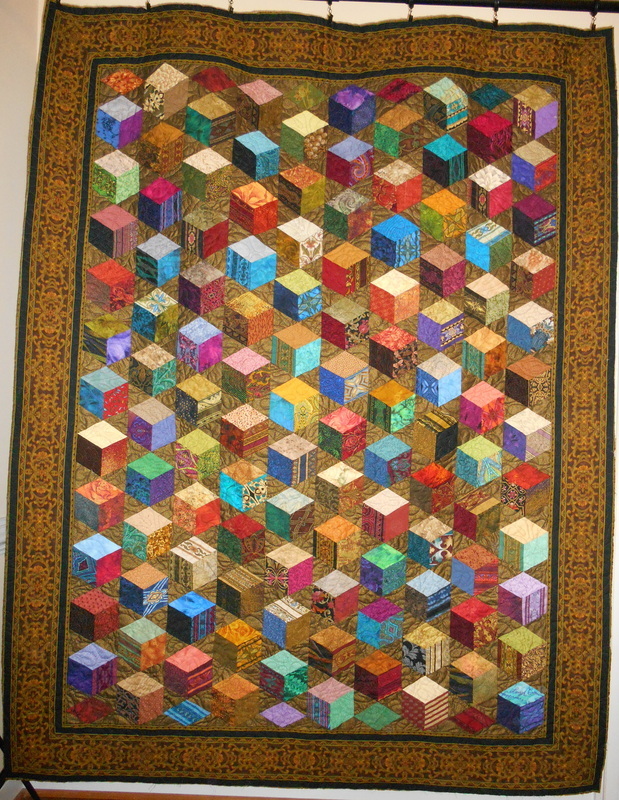 Machine quilted by Judy Hendrickson. To make this I made nine patches and then cut the corners off at an angle and set the blocks together. The cut off parts were used in the outside border. 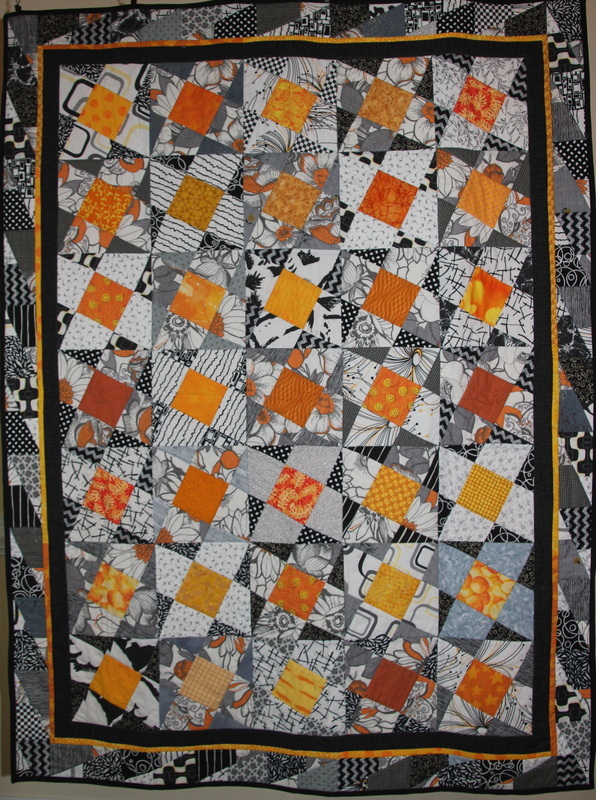 Most of the fabrics in this quilt are from the Jinny Beyer shop. Many of the people who work there are friends of mine and they were happy to let me raid their stashes for pieces of fabric. 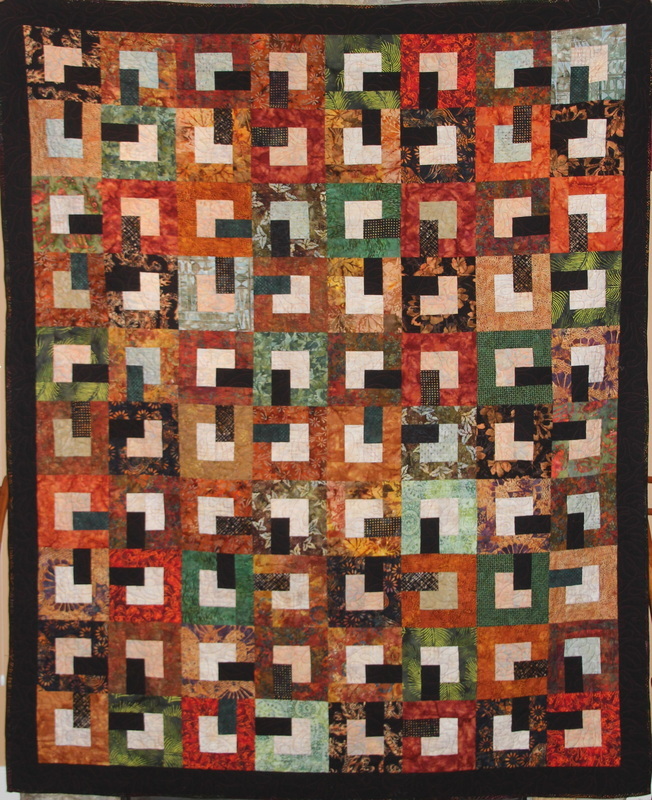 It was machine quilted by Judy Hendrickson. 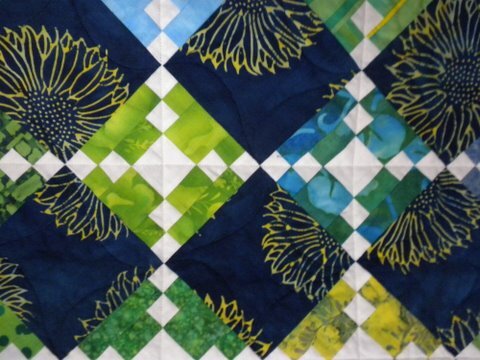 In my quilt guild we used to send squares of lemon fabric to those needing cheering up. 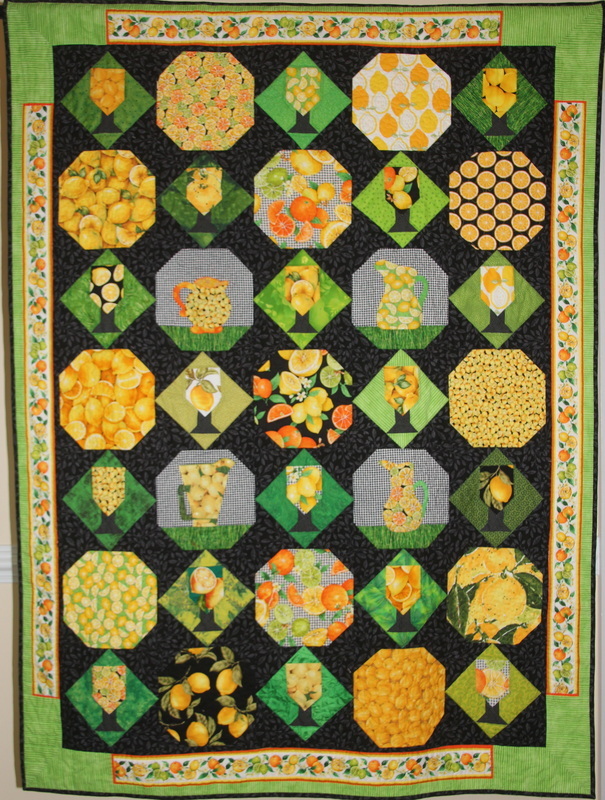 After much time spent wondering what to do with a collection of lemon fabrics I came up with this design. 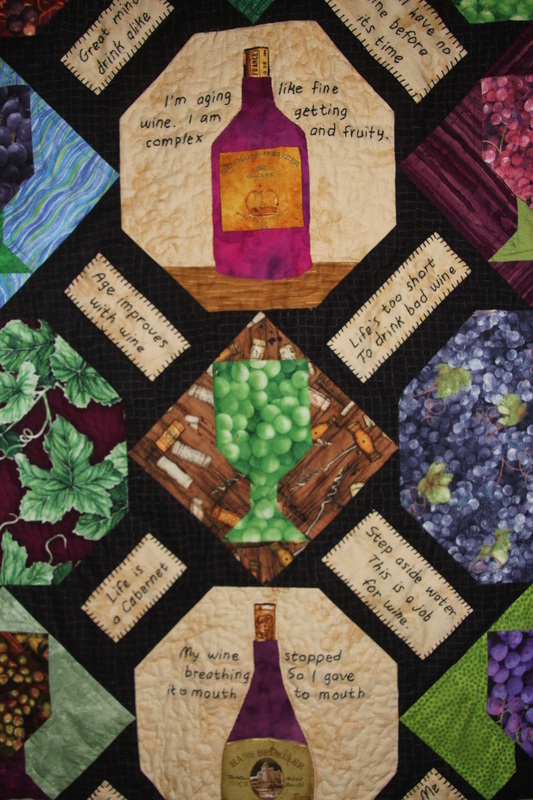 This has many design elements similar to the Lemonade quilt but done on a wine theme. 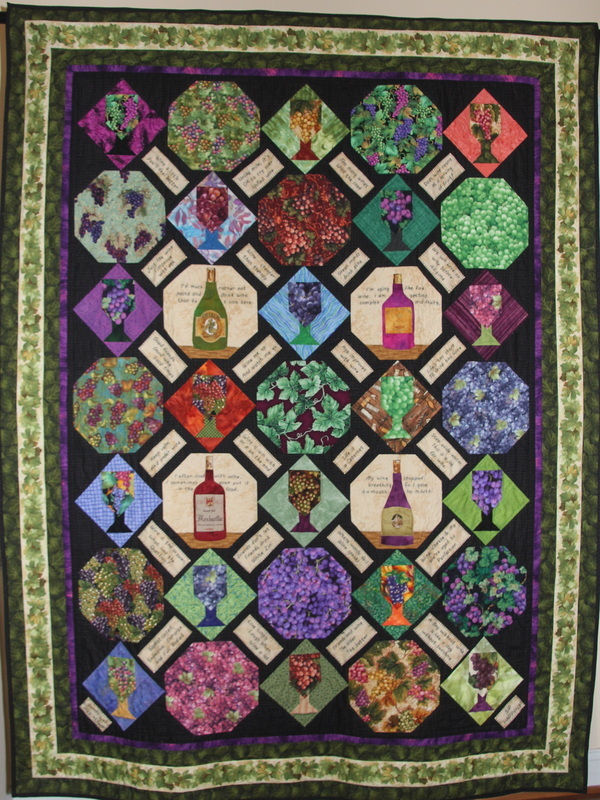 Fun wine sayings are embroidered and included. This was partly inspired by a trip to Napa Valley. 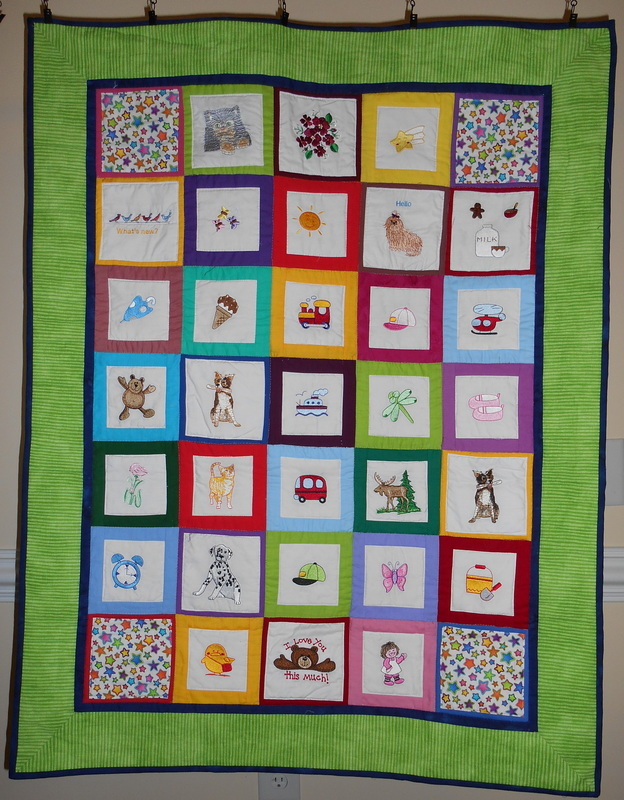 This quilt was made using vintage Christmas hankies and crocheted and knitted pot holders. 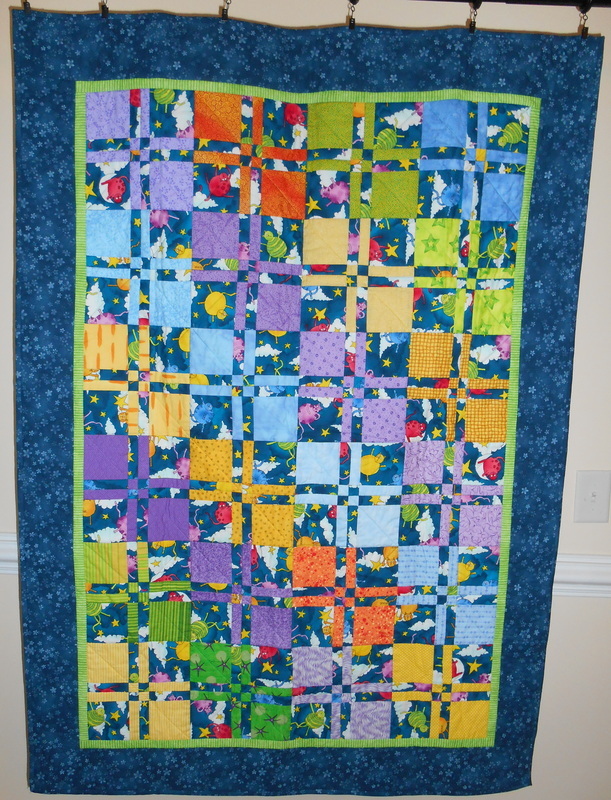 It was made and machine and hand quilted by me. 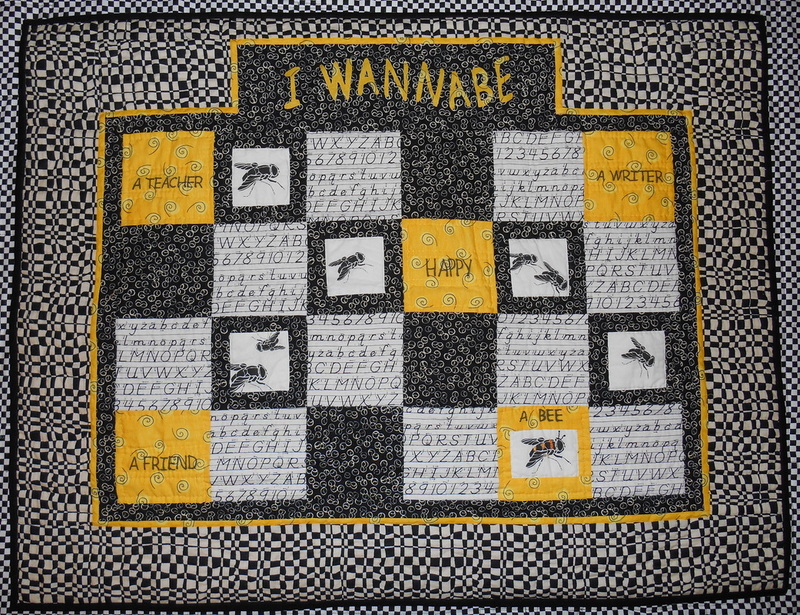 I made this as an effort to use my black and white fabric stash. Many of the star fabrics came from friends who were kind enough to let me get colors from their fabric stashes. 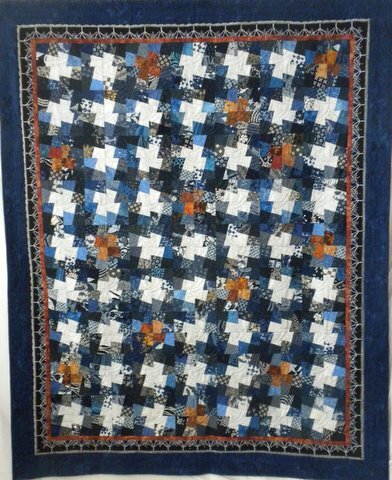 It was machine quilted by me.